While upholstered furniture offers the most comfort out of all furniture you can buy, comfy doesn't need to mean boring and drab. You value upholstered chairs like this one for their fine fashion and enormous decorative potential. 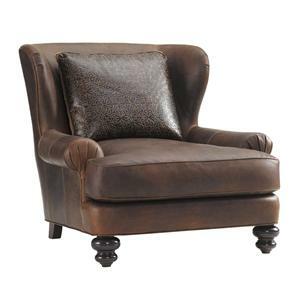 This traditionally-adorned armchair is available in a melange blend of upholstery materials, . 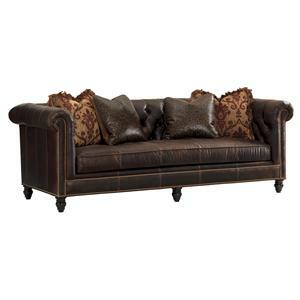 with an embossed brown leather back pillow, brown leather body, and seat upholstered in gold fabric. 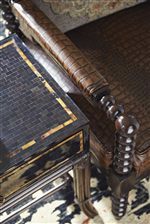 Each chair also features a sinuously curved seat rail and rolled arms adorned with nailhead studs. The loose pillow back cushion and reversible seat cushion both contain a luxuriously soft cushion blend that guarantees comfort and a tailored look that lasts for years to come. The Island Traditions Belgrave Leather Chair with Brown Leather Upholstery and Decorative Nailheads by Tommy Bahama Home at Hudson's Furniture in the Tampa, St Petersburg, Orlando, Ormond Beach & Sarasota Florida area. Product availability may vary. Contact us for the most current availability on this product.